Customers expect quality when they walk into your nail salon. Your nail station is where they will spend most of their time during their visit, so give them quality not only in the service you provide but also quality in the nail equipment and salon furnishings you have. Source One Beauty can help you with all your upgrades. 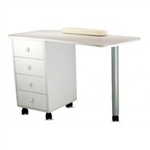 Select from a number of styles and functions out nail stations and manicure tables offer. We have something for everyone. Many of our professional manicure tables are available with cushion pads for your clients comfort, lamps for extra lighting and quick dry options, side storage drawers, and nail polish display stands. 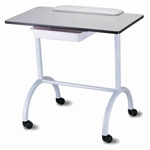 If you are a traveling manicurist or space is an issue, then consider our portable manicure tables and nail tables with casters option that can easily roll away. Check out our options bellow and give us a call – we’ll be happy to help you with your selection.